Busy bags can be a complete life saver. From the times when they are simply just bored and just want something to do, the moments that I need to make a phone call or when I am trying to keep my youngest busy while I work on school with her sister. Busy bags almost always seem to be the answer. 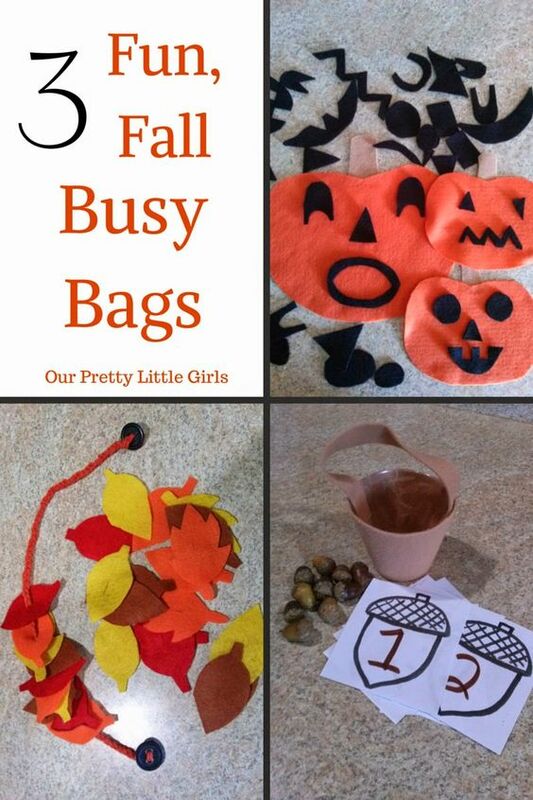 Today I am sharing 3 fall busy bag ideas. Season appropriate busy bags have been a favorite at our house since the arrival of Fall. We’ve included affiliate links to the products you’ll need to do the activities, in case you don’t already have them on hand at home. Working with felt is fun! Here are some ideas to keep your little ones busy with some cute fall and halloween themed quiet time activities. This fun busy bag lets kids create jack o lantern faces over and over and over again. I am always amazed at how long my girls can play with this. Materials needed: orange and black felt, possibly brown if you want to add stems. Simply cut a pumpkin like shape out of the orange felt, and glue on the the optional stem if desired. 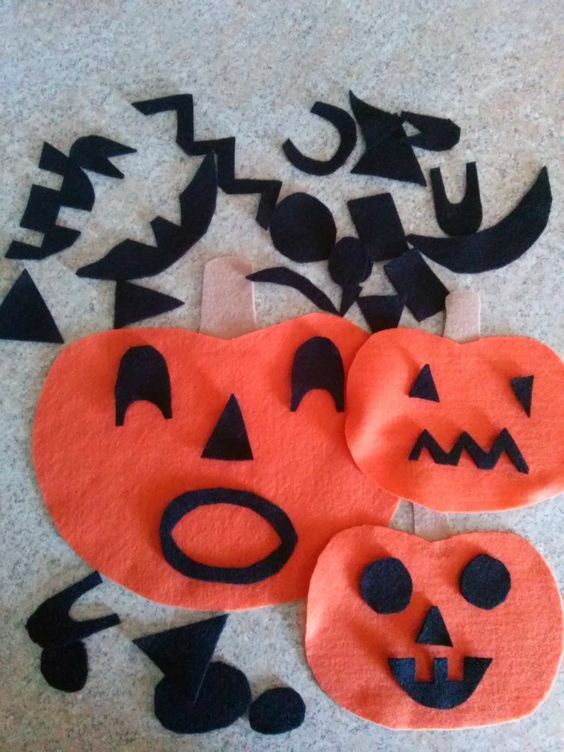 Then you can take your black felt and cut out all sorts of fun shapes for the eyes, noses and mouths. This game works on counting skills and adding skills. For a toddler version I made cards that have a numbers on them. The idea is to recognize the number and drop the right amount of acorns into the bucket. For older kids + and – signs could be added to create math problems. 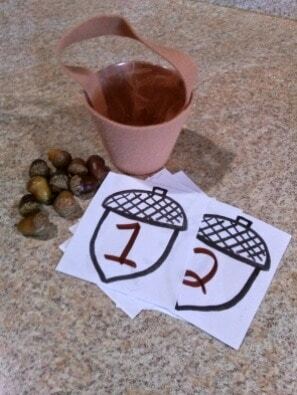 Materials needed: Acorns, bucket (I covered a plastic cup with felt and added a handle), Cards – download them here. All you need to do for this bag is locate a bucket and acorns. Then print out the acorn cards and write your numbers on them. Total Cost: Free – $3 depending on the bucket you choose. A classic busy bag favorite with a fun fall twist. This activity is great for working on fine motor skills. You can also add in card or extra leaves to work on making colored patterns. 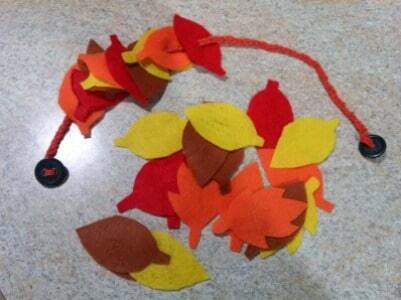 Materials needed: Orange, red, yellow and brown felt, Buttons, Rope or string. Print or draw a leaf pattern and cut out as many leaves as you wish. Cut a small slit in the leaves. You want them to be easy to get on, but not to easy. For the button string simply knot the rope on both ends of the button, gluing it in place for a safety. If you want to add pattern building you could use paper leaves or extra leaves to make the example pattern for the child to replicate. Do you use busy bags to educate and help keep you children occupied? Leave us a comment and let us know your favorite! I am a follower of Christ, a wife to Russ and mom to two amazing girls. We are proud to call the Midwest our home and are part of an amazing community and church. I am stay at home mom who loves to bake, knit, craft and tackle just about any DIY project. This fall we will start our second year of homeschooling an adventure we never imagined we would take. We are blessed! These are such fantastic ideas! I read about busy bags years ago, but hadn’t really made any. My little boy will be ready for some in just a few months, and I think I’ll be making the leaves one, definitely! Thank you for sharing! Beth, these ideas are so easy-peasy and totally budget friendly. You are a woman after my own heart! I think my son will love the pumpkin felt idea and the button hole leaves. Thanks for the inspiration. Have a great day! Hey Buddy!, I found this information for you: "3 Fun, Fall Busy Bags". Here is the website link: https://www.beautythroughimperfection.com/3-fun-fall-busy-bags/. Thank you.